ABC transformed the sports hall at Brighton College into a sophisticated venue for their annual Education Conference today, Thursday 5th May. Ivory marquee linings were adorned across the ceiling and each wall while light coloured flooring and five chandeliers finished the look. 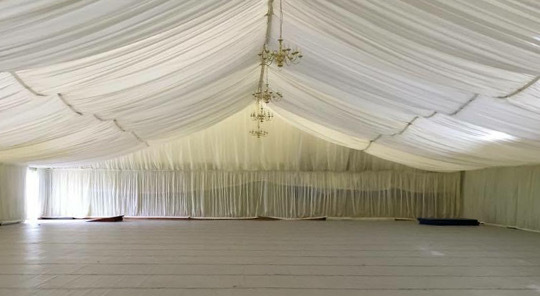 Our marquee linings are often hired to create a luxurious ambiance in function rooms and barns, and can also help with the acoustics in very large rooms that would not normally have furnishings, to help improve sound reverberation. Installation of the linings can usually be completed in under five hours and they can be taken down in even less time. This makes them the ideal decoration for a frequently-used multi-purpose hall such as those in schools and colleges. Please find out more about our marquee linings and accessories on our website, and of course, feel free to get in touch if you have any queries or would like a quotation.